We've entered a new Epoch of civilisation, people. The passage of time will now be measured in BJCC (Before Jaffa Cake Cake) and AJCC (After Jaffa Cake Cake). 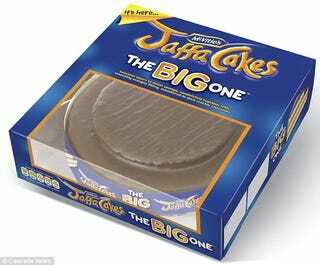 The plus-sized Jaffa Cake will cost £7, and is on sale in select supermarkets now. A staple snack in the UK and Ireland (seriously everywhere else, you're missing out), the Jaffa Cake Cake is perhaps manufacturer McVitie's ultimate stab at the british Taxman, after McVities won a hard fought legal battle in 1991 over the true snack-nature of the humble Jaffa Cake. Wait, what? Yes! In the UK, chocolate-coated (50% or more of the biscuits) biscuits are subject to Value Added Tax - however, Chocolate-coated cakes are not. McVities fought against the VAT Tribunal's ruling that a Jaffa Cake should be classified as a biscuit, and thus face VAT charges, due to its size and shape, as well as the fact that it was often eaten in the place of a biscuit. Popular myth has it that McVities defended the cake-ness of the Jaffa Cake by producing a cake-sized Jaffa Cake for the court. After assessing the Jaffa Cake under 11 specific criteria - including texture, consistency when stale, attractiveness to children (apparently Cake is more of an adult thing! ), and marketing - the tribunal decreed that the snack was a Cake, rather than a biscuit, and the United Kingdom breathed a sigh of relief as it narrowly missed a crisis the nation had not seen since the Second World War. Jaffa Cakes are serious business, you guys.